Cruise ships dock close to the center of town and the main attractions are within walking distance (1km, 10 min). Cruise vessels dock at berth no. 129/131 – larger vessels dock at the Eastern Harbour, where the water depth is 13.5 m.
Cruisers can walk to every major attraction in Arhus from the Terminal. For those who prefer to ride, cabs and local tour buses are available immediately outside the security gates. The city was settled by the Vikings toward the end of the first millennium, and by 1100 was a major regional port. Aarhus later faded from prominence until the 20th century, when the railway once again made the town a center of commerce. Now, the city is back on the map as an educational and commercial center with the Danish monarch's holiday palace. It is also a lively university town (the University of Aarhus features a wonderful park and museums). Visit the Old Town which is now a museum in which they show trades from the past. 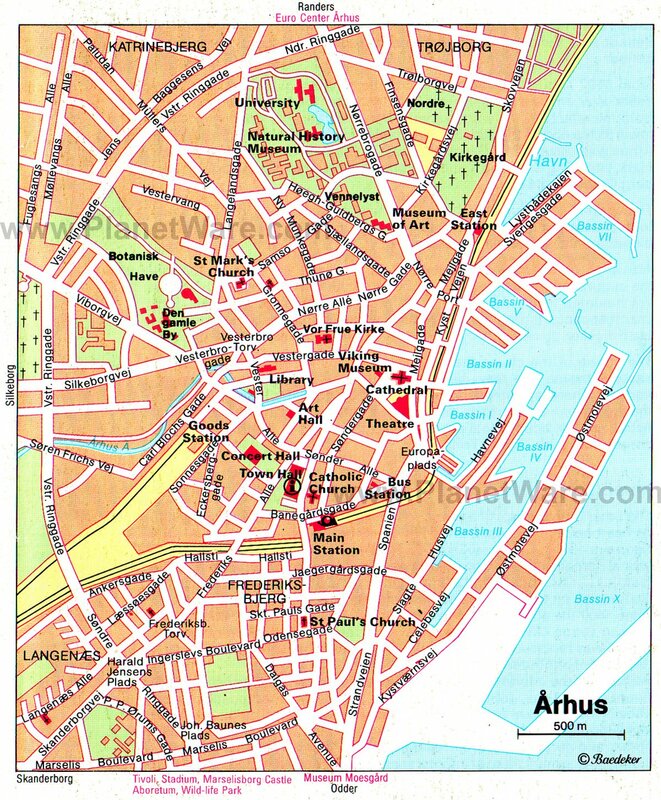 The buildings have been moved to Aarhus from various parts of Denmark. ARoS Aarhus Kunstmuseum looks rather uninspiring from the outside, but inside it’s nine floors of sweeping curves, soaring spaces and white walls. Intriguingly, the museum’s main theme is Dante’s The Divine Comedy; the entrance is on level 4, and from there you either descend into Hell (De 9 Rum, or The 9 Spaces, on the bottom floor, painted black and home to some moody installation pieces) or climb towards Heaven, which finishes at the rooftop terrace with views of the red rooftops of Århus. Visitors will enjoy the 30 bike stands which provide 250 bikes free of charge 24 hours a day for more touring. On weekdays from mid-June to mid-August the tourist office offers guided walks, taking in various sights according to themes. Visit Legoland Park, located in the Danish countryside near the town of Billund. The park is about 90 minutes from the piers, and visitors can see exactly what over 60 million Lego blocks can build, including miniatures of the White House and Mount Rushmore. There is also an amusement park with the usual distractions. The garden island of Funen is a full-day excursion and is the birthplace of Hans Christian Andersen. Visitors can visit his home, which has been preserved as a museum. There is also an open-air museum with buildings from the 18th and 19th century, all preserved to mimic town life as it once was. Fyrkat is one of five ring fortresses - perfectly circular earthen fortresses with four gates and two roads meeting at the center - built by Viking King Harald Bluetooth. Now revived and commemorated in Bluetooth technology. The earthen walls and the foundations of houses and roads are still visible and a re-created Viking farmstead populated by costumed museum staff provides an interesting look into the Viking Age. Lake District: Located on the Jutland Peninsula, this pristine area is a wonderland of tranquil lakes (74, to be exact), serene woodlands, the majestic Sky Mountain, and the charming town of Silkeborg, home of Tollund Man. Ebeltoft. Founded circa 1200, this market town on the southern Djursland Peninsula is one of Denmark's top vacation spots. The village features charming old cobblestone lanes lined with hollyhock, well-preserved, half-timbered buildings and popular beaches. The harbor holds the large battleship-The Frigate Jutland. Blown glass and miniature sculptures are highly unusual and (relatively) affordable. The Latin Quarter is a formerly seedy part of town now occupied by galleries of varying styles and price ranges. Many are located along Mollestien and Studsgade, easily reached on the way back to the dock after sightseeing. In case of rain: Bruun's Galleri Located next to the railway station. The biggest city mall in Denmark with 95 shops and a cinema. Strøget: 850 meters of fascinating shops tightly packed on both sides - some 100 shops in total. In this shopping paradise, you can find anything your heart could desire. Aarhus' pedestrianized high street stretches from the Central Station to the Cathedral. Allow for at least a couple of hours, especially if you want to take in one or two of the adjacent pedestrianized streets. There is a Welcome center at the dock where you will find tourist information and free WiFi.